From poverty to a peerage, with a cast-list including Neil Kinnock, Michael Howard, PapaDoc Duvalier, Donald Soper, John Humphrys, Len Murray, and Maya Angelou...Leslie Griffiths' story begins in real poverty in South Wales. Thanks to his outstanding intellect and a grammar school education, he became the youngest ever staff member at the University of Wales, before the call to ordained ministry led him, via Cambridge, to Haiti to work with some of the poorest people on earth. At the height of the Duvalier dynasty's power, he experienced Liberation Theology before it had been articulated and became the biographer of Jean-Bertrand Aristide, the Roman Catholic priest and Liberation Theologian who became Haiti's President. In England, Leslie Griffiths is one of the very people to have been elected President of the Methodist Conference whilst still a circuit (parish) minister. Tony Blair appointed him a working peer in the House of Lords. Principled and outspoken, he has a high media profile, is an impassioned ambassador for multiculturalism and does not shrink from controversy - nor from public criticism of contemporary culture and politics. A View from the Edge by Leslie Griffiths was published by Continuum in September 2010 and is our 44580th best seller. The ISBN for A View from the Edge is 9781441194299. We all find other people’s stories interesting. The questions asked at a first meeting are nearly always designed to elicit the other person’s story, where do they come from, what do they do, their family, opinions etc. An autobiography is usually a good read and this one is no exception. Biographies can be rather cerebral but an autobiography has an intimacy about it that brings it to life. 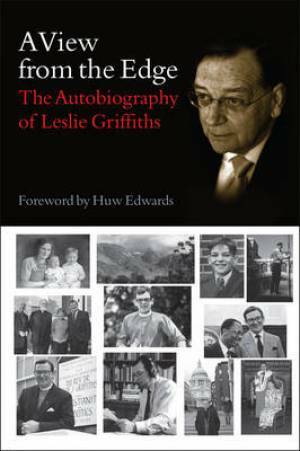 Probably best known as a Labour Peer and a former President of the Methodist Conference, The Revd Dr Leslie Griffiths was born into poverty at Burry Port near Llanelli when, in South Wales, coal was king. Deserted by his father at a young age, his mother struggled to bring up two boys in the most difficult of circumstances. Passing the 11+ set him on the road to Llanelli Grammar School, Cardiff University, itinerant preaching and, via a lectureship at Lampeter, to Methodist ministry. Full-time ministry requires that we go where God directs us, maybe somewhere quite different from our initial presumptions. Hoping for Hong Kong, the call was to impoverished Haiti, a place and people that has remained on his and Margaret’s heart. From there to north London and on to Wesley’s Chapel, broadcasting, contacts with a myriad of influential people and opportunities to be seized. Leslie Griffiths reveals himself as a man of deep faith, perseverance and vitality, love for people and the conviction of God’s call and leading. This is a story to encourage and inspire a well-written account of an extra-ordinary journey of faith, a remarkable, fast-moving and exciting story of a life given to God and of allowing Him to lead where He will, and a life that has brought countless blessings to millions. This book is to be highly recommended. Got a question? No problem! Just click here to ask us about A View from the Edge.